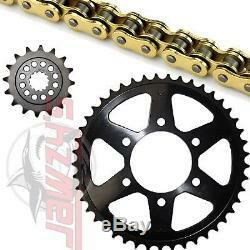 Part: SunStar 520 Conversion RTG1 O-Ring Chain 16-43 Sprocket Kit 43-3329 for Kawasaki. Installation Notes: When installing the front sprocket, mount it with the shorter boss side towards the engine and assure alignment with the rear sprocket Chain may need shortened. Be sure to test fit chain with new sprockets on the vehicle before removing links. Many bike manufacturers sell their production models equipped with Sunstar brand sprockets. All of Sunstar's sprockets are manufactured in Japan and are a great replacement for OEM sprockets. Sunstar's front sprockets are manufactured from case hardened chromoly steel for the ultimate in strength and durability. Then they go through a "parkerizing" surface treatment for corrosion and rust resistance. Sunstar's rear sprockets are constructed from the highest quality 1045 high-carbon steel and then go through Sunstar's exclusive heat treatment for added strength and wear resistance. Sunstar's steel rear sprockets are the strongest and longest lasting steel replacement sprockets available. TripleGuard (TG-ring) Sealed type chain. Rivet type master link included. Weight Per 100 Links lbs. Pin Length (mm) 22.85. Off-Road: 750 / Street: 1000. Sunstar's RTG1 is the premium road racing/highest performance chain in our lineup. It features our TripleGuard sealed ring technology, using 3 sealing lips and lubrication pools per side to maintain top performance in the extremely hot conditions experienced in performance use. The 520 version is the perfect choice for any sport street or race bike using a 520 pitch chain while the 530RTG1 is designed for that larger displacement, high performance machine like the Suzuki Hayabusa and/or Kawasaki ZX-14R for example. OEM Sprocket Ratio: 2.63. OEM Sprocket Ratio: 2.69. OEM Sprocket Ratio: 2.29. OEM Sprocket Ratio: 2.35. OEM Sprocket Ratio: 2.41. The item "SunStar 520 Conversion RTG1 O-Ring Chain 16-43 Sprocket Kit 43-3329 for Kawasaki" is in sale since Tuesday, July 26, 2016. This item is in the category "eBay Motors\Parts & Accessories\Motorcycle Parts\Drivetrain & Transmission\Chains, Sprockets & Parts".